I took up running a year or so ago, on May 2nd 2015 – to be precise. I know this because the first thing I did when I started running was buy a fancy GPS runner’s watch. I started because I wasn’t very fit, and the gym was expensive and didn’t really fit around my available time. You can see some statistics on my running in my earlier blog post. Not long after getting the watch I bought some proper running shoes and since then I’ve lost 10kg and gone from “running” 5km in something over 30 minutes to running 10km in under 50 minutes. 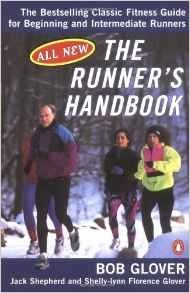 But I’ve got a bit jaded and stuck in my running ways, so I thought I’d get The Runner’s Handbook by Bob Glover to help me with my next steps. There are a wide range of guides on the internet, but I’m a committed book buyer. Running is pretty much my only exercise, although I cycle 40 miles to work and back most weeks this is at a fairly leisurely pace. I’m aware that the lower half of my body, heart and lungs are quite fit but the rest is not – sort of like and inverted Popeye. There is an early opportunity to test your current fitness with some standard exercises in The Runner’s Handbook. It turns out I’m in the top 25% for running speed over 1.5 miles which makes me an intermediate runner, but linger in the lower half for upper body strength and flexibility. To be honest, the push-ups test left me aching for several days after my over-enthusiastic efforts! The Handbook is pretty comprehensive, 700 pages of comprehensive. It covers fitness, and the motivation for getting fitting, running programmes for different standards of runner, training for races, all the way up to the marathon distance and also training for speed. I read the first 250 or so pages covering these topics and a further 100 or so on Running form and Supplemental Training. I’ve skipped sections on food and drink, running environment, running lifestyle, special runners and illness and injury. I can always dip into them if the need arises. The writing is very readable, Glover chatters his way through the book half in conversation with his co-author Jack Shepherd. Glover is a real enthusiast for his sport. He has trained many amateur runners, and you get a feel for New York state and the New York Marathon through his writing. He introduces some of the history of the modern running movement, dedicating the book to Fred Lebow who took the New York Road Runners Club from 200 members to over 30,000. He also took the New York Marathon out of Central Park and into the city, a pattern subsequent repeated around the world. Glover also dedicates the book to Nina Kuscsik, who was instrumental in getting women admitted to longer distance races, starting with her own run in the 1972 Boston marathon, which was accompanied by significant male protest. I was bemused to read that the original sports bra was constructed in the late 1970s by stitching two jockstraps together. As a result of reading the boo I have a set of stretches and upper body strengthening exercises to try out. The sections covering these are a bit repetitive and could really have done with some diagrams. Fortunately, having introduced dozens or exercises Glover does provide a sample work out with a more manageable set of things to do. I must admit one of my problems with running is that I try to go faster with every run I do. Reading The Handbook has backed me off from this futile quest. Now I can go out for a run and not feel I’ve failed if I don’t beat my previous fastest time. The second thing I’ve learned is that I have to get a heart rate monitor! Okay, so Glover says I could do some crude manual measurement involving feeling my pulse and counting but where’s the fun in that? The idea being that you are in cardiovascular training mode when you reach something like 70-80% of your maximum heart rate. I have my eye on the Garmin Forerunner 235 or maybe the cheaper Garmin Forerunner 35. These both have light-based heart monitors under the wristband of the watch rather than the more usual (and cumbersome) chest monitors. By the way, you’re not going to read about the very latest gadgets in Glover’s book – this edition is from 1996 but it doesn’t feel at all dated. This was the right sort of book for me, it is comprehensive and authoritative, it reads well and there are some things I can go away and do now to improve my running.